People needed accurate information about their risk of contracting AIDS. While discouraging unfounded fears, Public Health staff responded cautiously, as the disease was just beginning to be understood by the medical community. 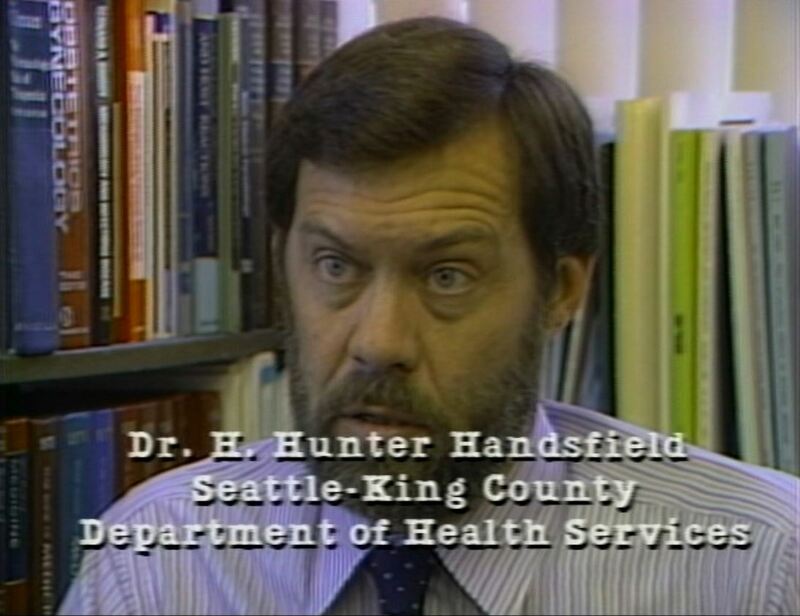 Through various approaches—including town hall meetings, communication with local media, brochures, direct correspondence, and the AIDS hotline—the Seattle-King County Department of Public Health sought to educate the general public on the latest scientific understanding of AIDS, serving a critical role as public fear grew. In the correspondence below, one individual was concerned about a shared communion chalice, and another speculates on the possibility of getting AIDS from salad prepared by an infected individual. Published in 1984, this brochure responded to concerns among public safety and medical staff that they might contract AIDS while on duty through contact with infected individuals. Uncertainty in the medical field about AIDS could worsen people’s fear, which could also increase existing hostility toward high-risk groups. This 1983 brochure answered questions with an honest assessment of the current knowledge about how to avoid contracting AIDS. Fear of AIDS led to discrimination against people suspected of having the disease. There were calls for registration lists and quarantine of individuals suspected of being sick with AIDS. Loss of employment and housing were realistic concerns. This 1985 memo discusses calls to the AIDS hotline from individuals who had lost their jobs after their employers found out that they had been diagnosed with AIDS. 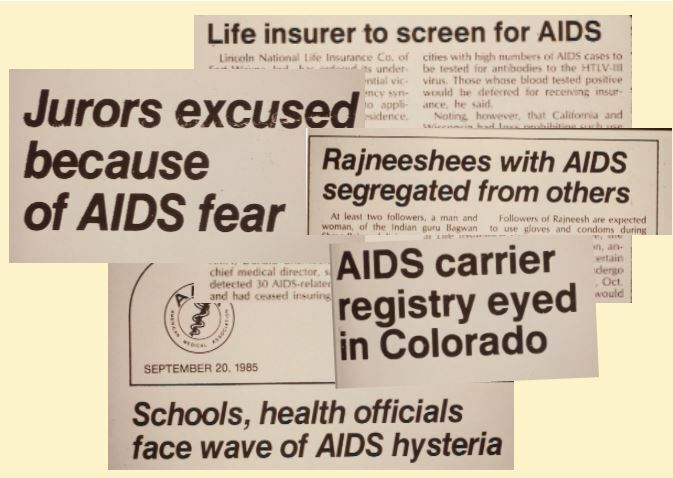 Headlines included in a 1985 presentation by Public Health, illustrating the impact of a fearful public reaction to AIDS. While Public Health worked closely with organizations such as the Seattle Gay Clinic, many in the gay community mistrusted the idea of a “surveillance” program, fearing that patient names might appear on government lists that could be used to discriminate against them based on their sexuality or illness. In 1983, the Department had to reassure the community that Seattle police were not maintaining lists of people with AIDS. See the Department’s news release. 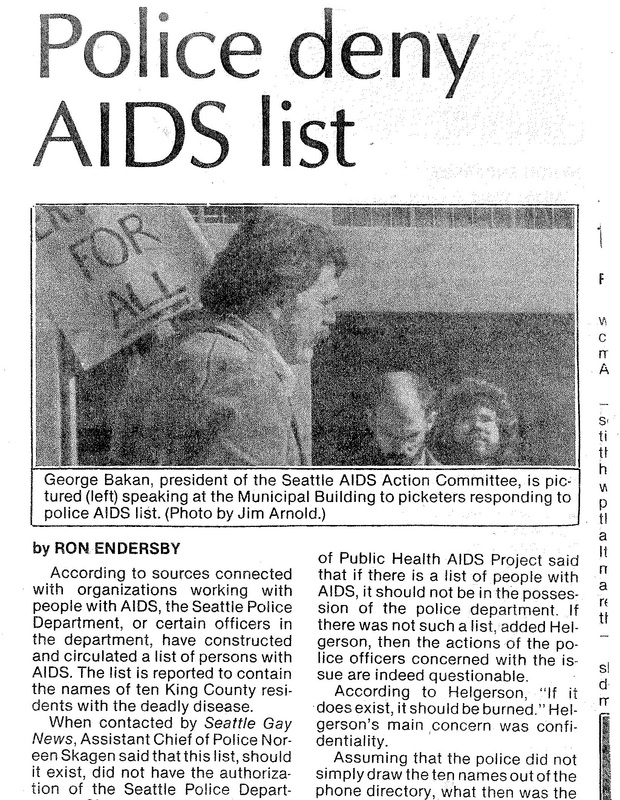 Clipping from Seattle Gay News story on leaked list of individuals identified as having AIDS. Public Health leaders worked closely with local media to promote public understanding about AIDS and to discourage sensationalist reporting. In 1984, Seattle’s public television station, KCTS-TV, produced a Peabody-award-winning documentary program, Diagnosis AIDS, about the Seattle-King County response to AIDS. Some public television stations in other parts of the United States refused to air the program, citing its “controversial” nature. Local efforts working with the media sometimes met with mixed results. In 1986, only one of three major local television stations would air a public service announcement produced by the Northwest AIDS Foundation and funded by Public Health and the federal Centers for Disease Control. Letters to King 5 Television, KOMO-TV, and KIRO-TV regarding the stations’ decision to air or not to air the PSA.